A new attacker Unit for Murakumo makes its appearance, that enables multiple attacks with Shadowstitch! Shadowstitch – AUTO (RC) 1/Turn Generation Break 2: [Counter Blast 1 & Choose another of your (RC) “Grudge Stealth Rogue, Sodehagi”, place it on the bottom of your Deck] At the end of a battle in which this card attacks a Vanguard but does not hit, you can pay the cost. If you pay it, Stand this Unit, during that turn, it gains Power+5000. Finally today, the “Touken Ranbu -Hanamaru- Deck Set” goes on sale! “Yamatonokami Yasusada -Hanamaru-” and “Kashuuki Yomitsu -Hanamaru-“, included in this set, have special artwork drawn specifically by the animation studio! And these two also come in autographed foil card versions with autographs by Ichiki Mitsuhiro (the voice actor of Yamatonokami Yasusada) and Masuda Toshiki (the voice actor of Kashuuki Yomitsu), both a single copy in each Deck Set, with “Yamatonokami Yasusada -Hanamaru-” in Set 1 and “Kashuuki Yomitsu -Hanamaru-” in Set 2. Now, go, and get your hands on them! 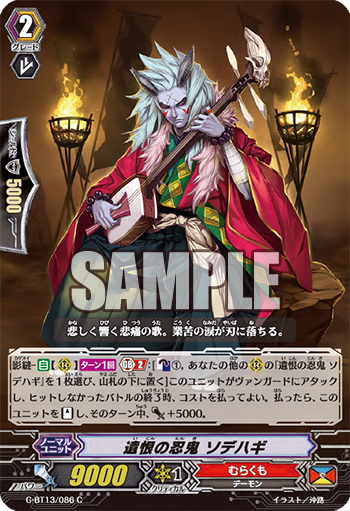 Also the 《Murakumo》 card, “Grudge Stealth Rogue, Sodehagi” has a 【Shadowstitch】 ability in which at the end of a battle in which its attack doesn’t hit, by placing 1 Rear-guard with the same name as this card on the bottom of your Deck to have this card Stand and gain Power+5000. By using its ability and Critical Triggers you can raise the Critical of “Grudge Stealth Rogue, Sodehaki” and all the while you raise its Critical, you’ll be able to continuously attack. “Ultimate Stride” contains many Units that further bolster 《Murakumo》, so please look forward to future information! We’ll be introducing more cards from the 6th Clan Booster “Rondeau of Chaos & Salvation” and the 13th Booster Pack “Ultimate Stride” in future “Today’s Cards”! Please look forward to it!